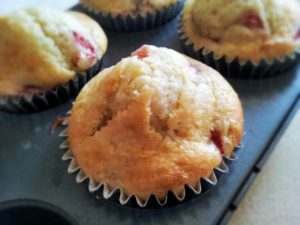 Fresh strawberry muffins: It’s impossible to know exactly how long we have been making our fresh strawberry muffins. All we know is that every time we present them warm from the oven to the breakfast table, they are devoured!! You may notice that we have used foil as our muffin cup. 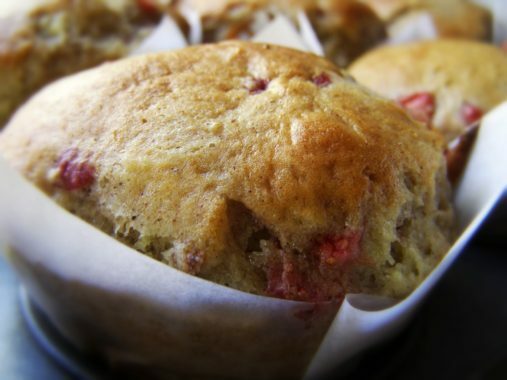 This is because the muffins in the photograph below were made on the tiny Italian island of Ponza. Deliveries of goods to the local shops can be a little intermittent so you have to improvise … often. It works just as well as a muffin cup but with less expense. If you make as many muffins as we do, then expense is very important. NOTE: If your consistency seems a little too runny, simply add a bit more flour. Pre-heat the oven to 370 F / 190 C.
Prepare your muffin tray. We use foil or baking parchment because you can shape it better and it will help avoid spills. In a large mixing bowl add all of the DRY ingredients and stir it all with a large spoon to combine well. In a jug, measure the oil and then add the 2 eggs and vanilla extract then gently mix with a fork. There is no need to whip it. Pour the eggs and oil into the flour mix and stir with the spoon. The consistency will be a little thick. 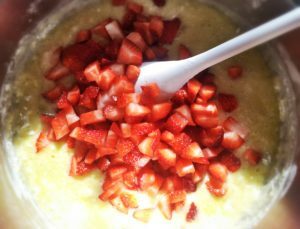 Add the fresh strawberries and don’t worry if you squash a few as you mix them into the batter. 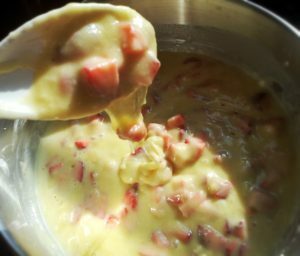 Add the milk a little at a time until the batter has reached a thick, dollopy consistency. 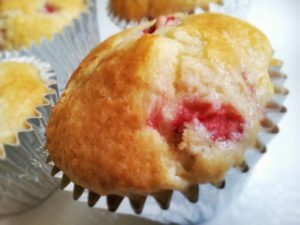 Pour the batter into a jug for easier handling and fill each of the muffin cups. Place in the center of the oven for 17 minutes (the time will depend on your oven). 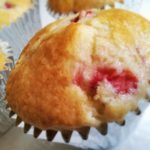 Run a skewer through a muffin and when it comes out dry, your muffins are ready. Allow then to cool and serve them warm.